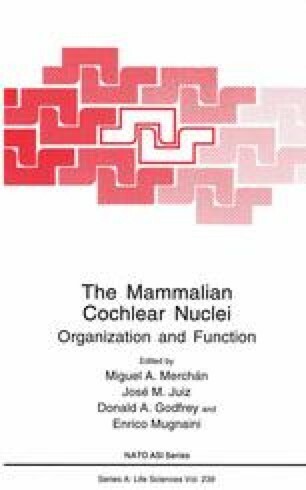 It has been recognized since the time of Held (’93) that there are a number of non-primary inputs to cochlear nucleus (CN) neurons. With passing years, knowledge of a variety of different sources of these inputs has increased (e.g., Elverland,’77; Adams,’83; Spangler et al.,’87) but we are still largely ignorant concerning the details of which cells in a given location give rise to CN inputs and also which CN cells receive inputs from given sources. One tool that can aid in sorting out such details is immunocytochemistry. The availability of antibodies that permit visualization of chemically distinct cell classes and their axonal endings in the CN offers a means of studying origins of given inputs and learning about their terminations within the CN. Unfortunately, usually there is ambiguity regarding the origins of immunostained terminals because there are multiple possible sources of terminals which are immunopositive for most antigens. Because of the complexity of the problems involved, there has been relatively little progress in sorting out specific pathways even with the aid of immunocytochemistry. It is therefore premature to attempt a review of progress of this work. Instead, this report will give a brief status report of what some promising antibodies have revealed about non-primary CN inputs. Results reported here were obtained in cats using previously described procedures (Adams and Mugnaini,’87). Selected examples of immunostained terminals in the ventral CN (VCN) are shown in Figure 1 and the dorsal CN (DCN) in Figure 2, which includes all four DCN layers for each antibody. Neurons that may be the sources of these and other CN terminals are illustrated in Figures 3 and 4.